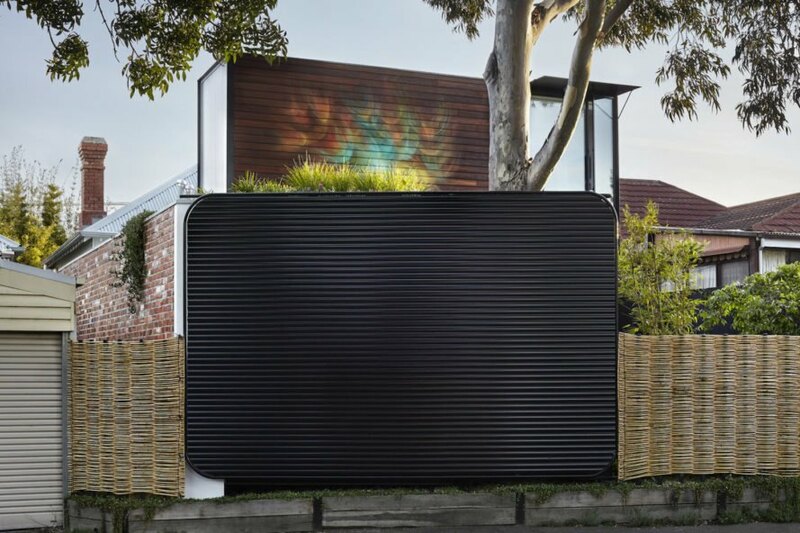 Austin Maynard Architects completed their latest project, a 12-month build that’s stunning, playful, and eco-friendly. 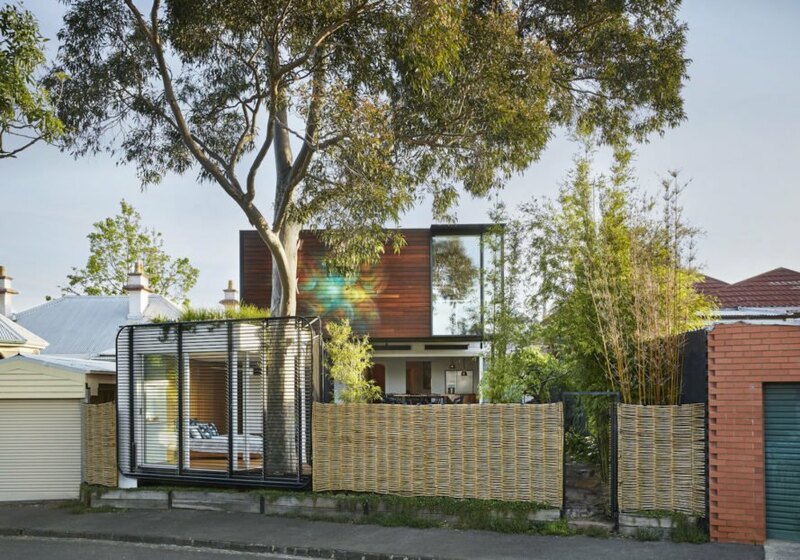 Commissioned by a couple that works from home, the Kiah House is a live/work extension in North Fitzroy, Melbourne that comprises a master bedroom with a treehouse-like office stacked on top. The beautiful home draws inspiration from Japanese and Buddhist influences to create a modern sanctuary that embraces outdoor living and contemporary art. The Kiah House was constructed as an extension to an original 1927 Victorian-era house and to meet the clients’ desires for “a sanctuary” with a “strong and positive vibe.” The original weatherboard home was renovated with a new spacious kitchen and dining area that spills out to an outdoor deck. Two bedrooms, a lounge, and a bathroom are also located in the original cottage. The master bedroom en suite is placed in the extension’s ground floor and is screened with operable louvers from street view. “At Kiah House we were charged with the task of creating spaces, both private and shared, that spill out into the garden and yet adaptable enough to create solitude and privacy when needed,” wrote the architects. 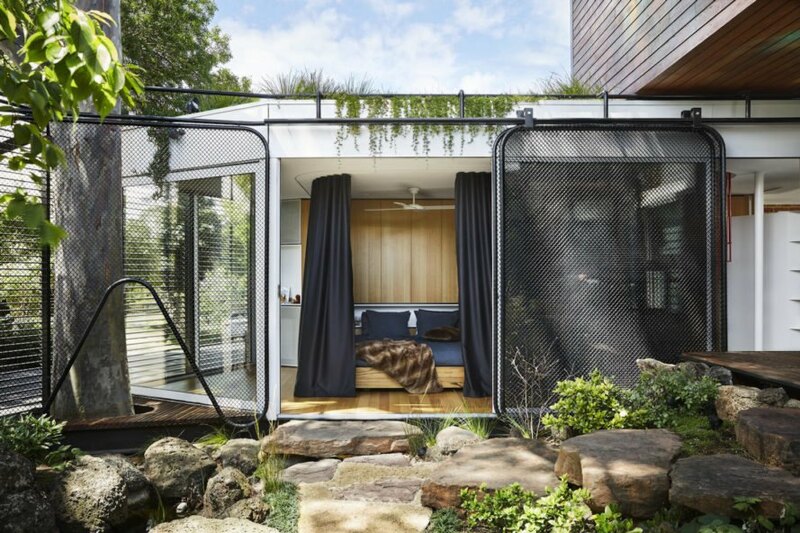 “The master bedroom ‘haven’ has a dedicated Buddhist prayer space and opens up to the garden and ponds via sliding double-glazed glass panels blurring the lines between inside and outside. 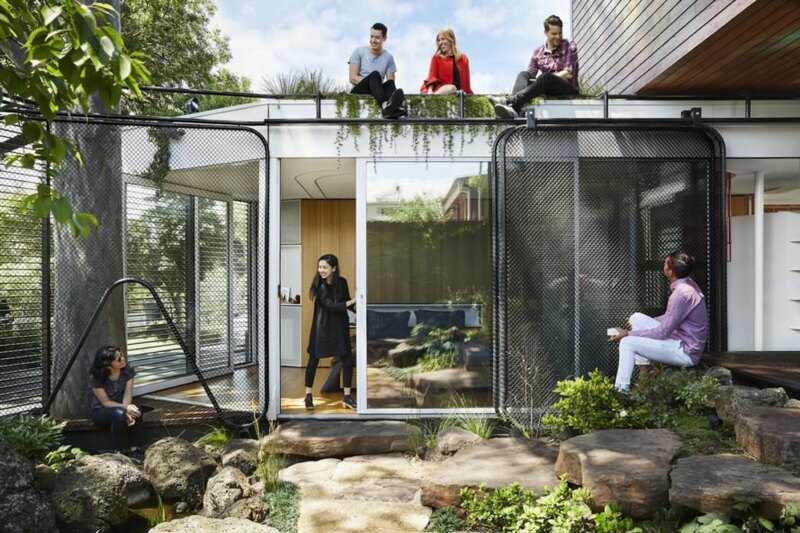 The towering lemon scented gum tree is enclosed by a small deck area, a place for the owners to “sit and meditate”.” The bedroom roof is also covered in plants and edible vegetation that can be seen from the second-story office, which also overlooks the gum tree canopy. A colorful mural called ‘Awakened Flow’ by artist Seb Humphreys of Order 55 was painted on the office’s spotted gum cladding. The renovation of the home and the addition of an extension were completed with sustainability in mind. Timber salvaged and recycled from the CSR sugar mills in nearby Yarraville is used throughout the kitchen, while the red clay bricks that line the bathroom were all reclaimed and hand-cleaned from demolition sites around Victoria. The home is optimized for natural light, passive solar gain, and natural ventilation. All windows are double-glazed and high performance insulation is used throughout. Collected roof water is reused for irrigation and to flush toilets. A solar array has also been installed on the roof. Austin Maynard Architects completed their latest project, a 12-month build that’s stunning, playful, and eco-friendly. Commissioned by a couple that works from home, the Kiah House is a live/work extension in North Fitzroy, Melbourne that comprises a master bedroom and a treehouse-like office stacked on top. The beautiful home draws inspiration from Japanese and Buddhist influences to create a modern sanctuary that embraces outdoor living and contemporary art. The original weatherboard home was renovated with a new spacious kitchen and dining area that spills out to an outdoor deck. Two bedrooms, a lounge, and a bathroom are also located in the original cottage. The master bedroom en suite is placed in the extension’s ground floor and is screened with operable louvers from street view. 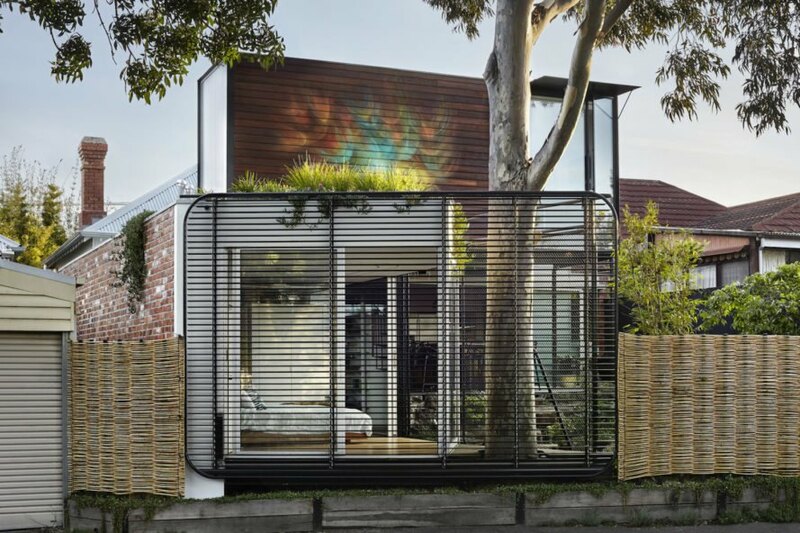 The bedroom roof is also covered in plants and edible vegetation that can be seen from the second-story office, which also overlooks the gum tree canopy. 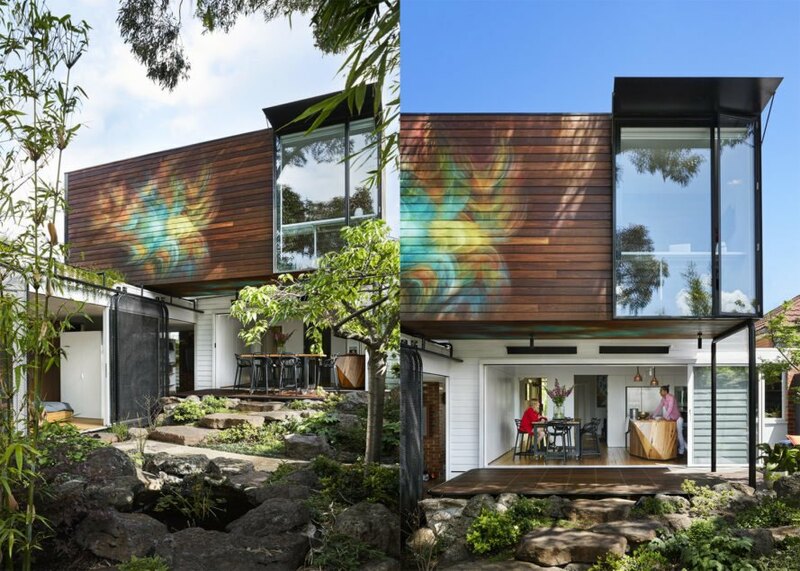 A colorful mural called ‘Awakened Flow’ by artist Seb Humphreys of Order 55 was painted on the office’s spotted gum cladding. 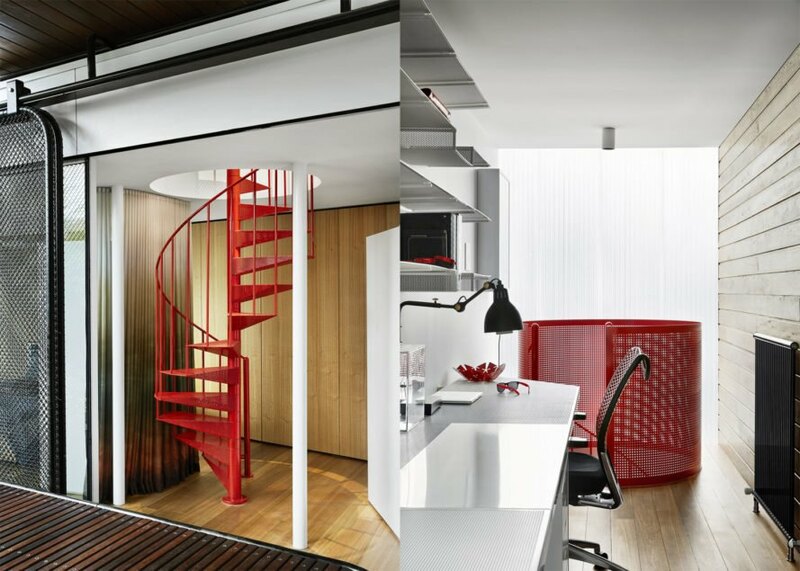 The renovation of the home and the addition of an extension were completed with sustainability in mind. 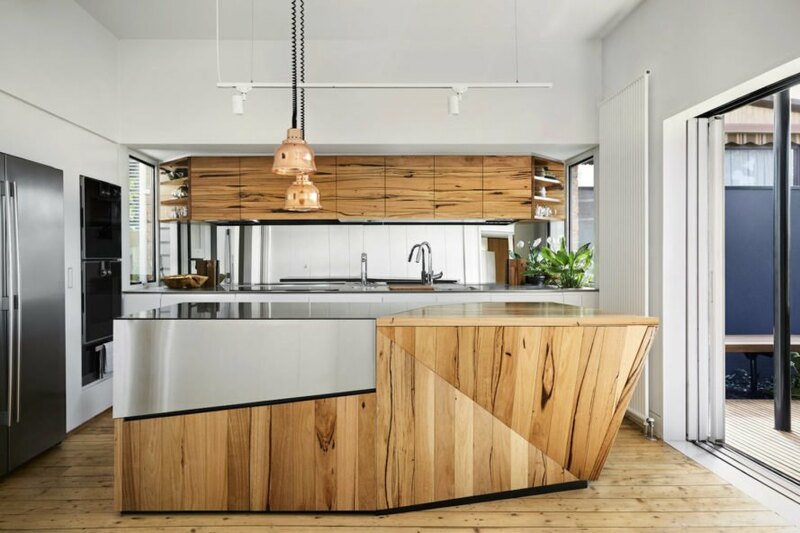 Timber salvaged and recycled from the CSR sugar mills in nearby Yarraville is used throughout the kitchen. 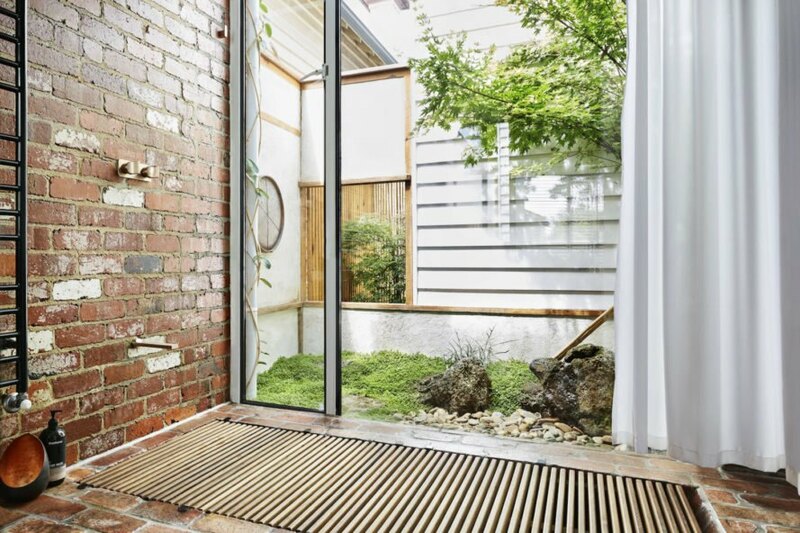 The red clay bricks that line the bathroom were all reclaimed and hand-cleaned from demolition sites around Victoria. The home is optimized for natural light, passive solar gain, and natural ventilation. All windows are double-glazed and high performance insulation is used throughout. Collected roof water is reused for irrigation and to flush toilets. A solar array has also been installed on the roof.